WHERE: Dubuque, Iowa. WHAT: an innovator ahead of his time. MAP: Dubuque, and the US Capitol. Thumbnail click pops-up source page. The Daguerre weblog on the Journalspace.com service wastes no words. When we visited there were seven vintage images for July of this year, and nineteen for June. The pictures, however, are informatively captioned. There are Ambrotypes, Ferrotypes, albumen prints, and of course a selection of Daguerreotypes. 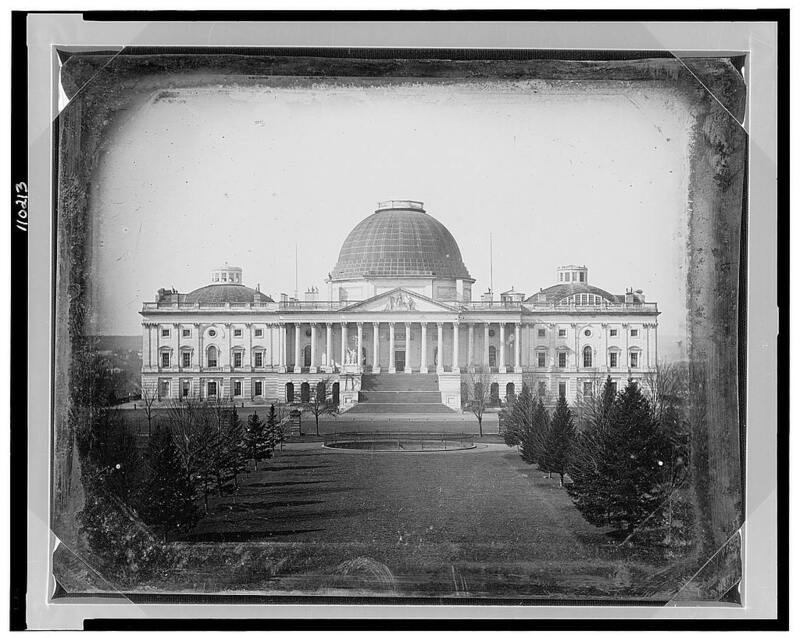 The picture we chose was the entry for the 04 July 2004, captioned "In honor of Independence Day, here is an extraordinarily rare Daguerreotype, circa 1845, showing the capitol building in Washington, DC. This photograph was made before the two wings and larger dome added later in the 19th century. This image was made by Plumbe, who later went mad from exposure to the chemicals used to make Daguerreotypes." The American Memory web site has a Daguerreotype feature, including an index page of the main exponents, and another Capitol picture. We thought you might ask: a picture of the updated building is available, now in full color, though photo processes are now known by less poetic names, such as K-14 and C-41. We knew 'mad as a hatter' was derived from occupational poisoning caused by the use of mercury to dress beaver fur for the millinery trade; one of the suggested derivations for 'plumb crazy comes from a similar reference to lead (plumbum in Latin) poisoning, but perhaps the alleged madness of John Plumbe Jr. (1809-1857) provides an alternative, if somewhat fanciful, explanation. As the franchiser of a portrait studio chain (and the founder of the gloriously named National Plumbeotype Gallery) who took few pictures himself, it seems unlikely that the chemicals were the cause of his mental condition at the time of his suicide: bankruptcy, malaria, and unfulfilled business ambitions for the creation of a transcontinental railroad (an idea for which he is sometimes credited as the originator), do seem more likely candidates.